Disclosure: Party of 5 was provided a sample in order to bring you this review. All opinions are my own. This Christmas why not give a loved one a special piece of jewelry? 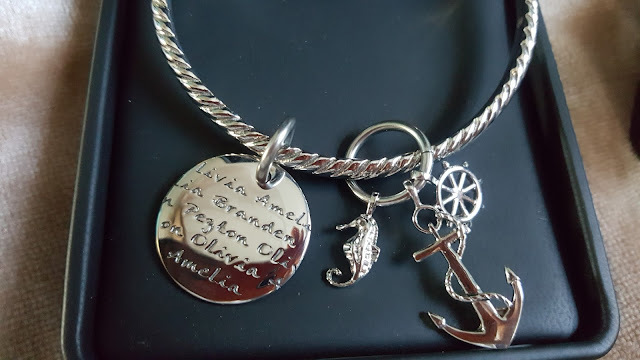 I love anything that has all 4 of my kids names on it whether it be a bracelet, necklace even a piece of paper. Although Carved Creations was launched in 2008, the founders were no strangers to the world of personalized jewelry. Wes Weaver, President and CEO, is a seasoned professional with jewelry industry experience reaching back to the 1980's where he served as a top marketing executive at Artcarved. While there, he invented the genre of jewelry now known as "Mother's Jewelry." He currently also serves as CEO of John Christian Jewelry. Weaver's business partner, T.C. Waugh, serves as Creative Director, and has over 10 years of experience in the jewelry industry. Born into a family of jewelers, Waugh is the 3rd generation in his family to pursue this ancient craft. He currently also serves as Creative Director for John Christian Jewelers, alongside Wes Weaver. Dissatisfied with the thin, lightweight Mother's Jewelry that began to proliferate in the last decade, Weaver and Waugh decided that it was time for someone to develop high-quality, sturdy Mother's Jewelry that was professionally designed and professionally crafted, using the right blend of old-world craftsmanship and the latest technology. They jumped on the task and have been developing designs as the industry leader in the world of Mother's Jewelry ever since. Their attention to detail and quality can be found in every Carved Creation. When you feel a Carved Creations design, you know you are holding the best. Carved Creations has the most unique gifts I have seen. Choosing a few pieces as tough but the 2 that really called to me were the Vesta Sea Charms Bangle Bracelet with an anchor and seahorse. 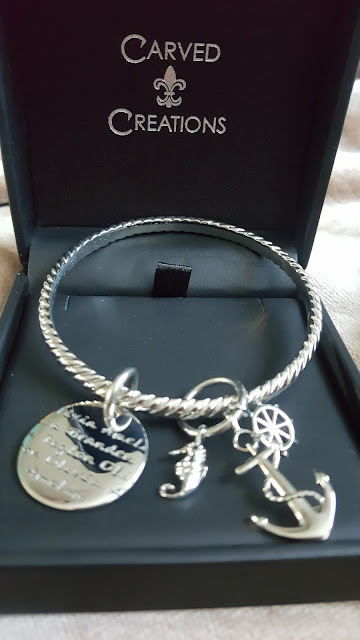 I feel like my kids are my anchor that keep me grounded so this bangle bracelet touched my heart. This bangle is beautifully made and features 3 charms. 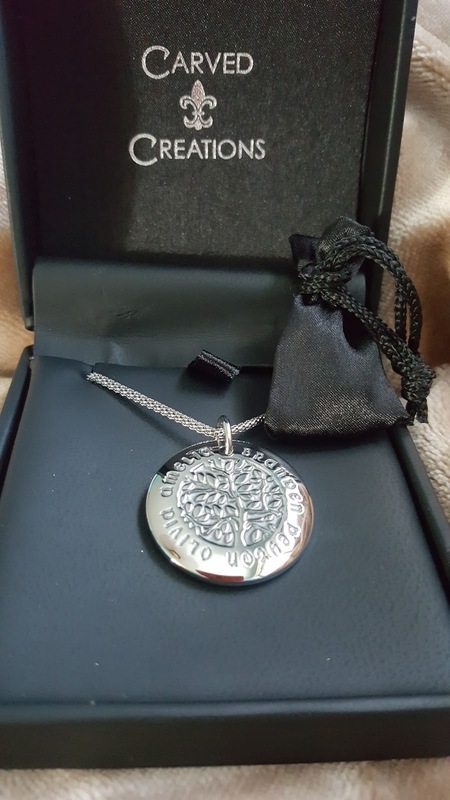 Right now it is on sale for $99.50 and you can add up to 5 names to it. 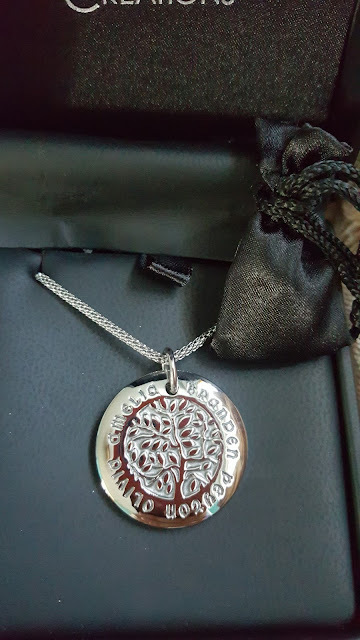 The next piece I chose was the LifeNames Family Tree Pendant. I don't have one with all 4 kids names and birthstones on it so this was perfect for me. 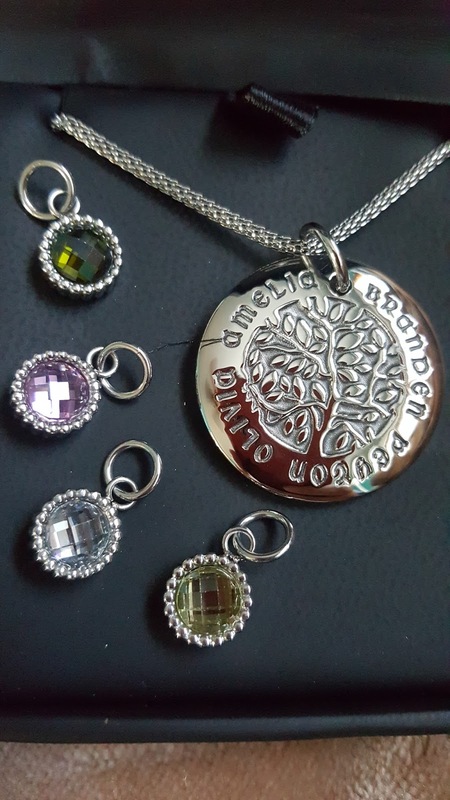 This beautiful pendant necklace comes with up to 6 birthstone charms and names. 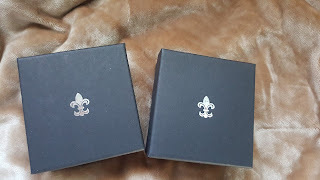 You can chose your type of chain from 3 options such as mesh, rolo or leather cord. I chose the mesh because I just like the way it looks. This is not a flimsy pendant, in fact it is pretty heavy so you know it will last for years. 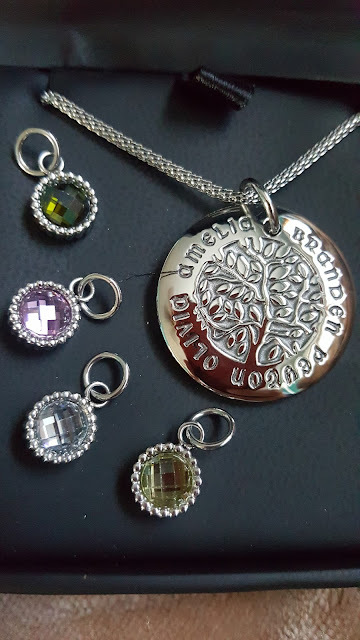 The birthstone charms come in a separate bag making this the perfect gift. Carved Creations has Mother, Monogrammed, Sports, Couples and Fashion Jewelry. I assure you that you will find something or a few things that you will want. Right now Carved Creations is offering 50% off jewlery while supplies last. Party of 5 also has a discount code for you! Use P5C15 at checkout to save an extra $5 off! 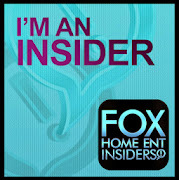 This code is good through December 31! Win It: Party of 5 is giving away a $200 gift code!